Home improvements are constant in our house. 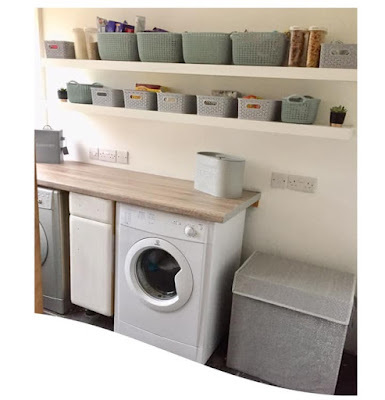 Home interiors and decor frighten me too and there is always something that needs doing or a job that isn't quite finished. Now the children are getting older (although no more helpful!) we are trying to make the house a home and decorate the house how we really would like it. Apart from a fresh coat of paint and some new curtains around five years ago our bedroom hasn't been top priority. As it was unloved it became the dumping ground for everything. The children also delight in bringing in books and toys that never left and the husband had a pretty impressive floordrobe! So over the past couple of months or so we decided to change all of that and finally make our bedroom one of the nice rooms that we wanted. I'm not the best when it comes to home interiors and decor. 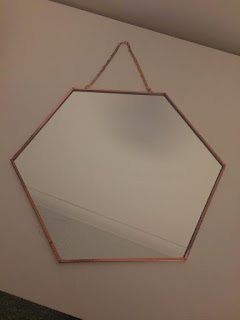 I see so many homes and interiors on social media that I am so envious of and yet if I tried to do anything it would look like one of those disasters from BBC'S Changing Rooms back in the 90s. The start of it all was navy paint. 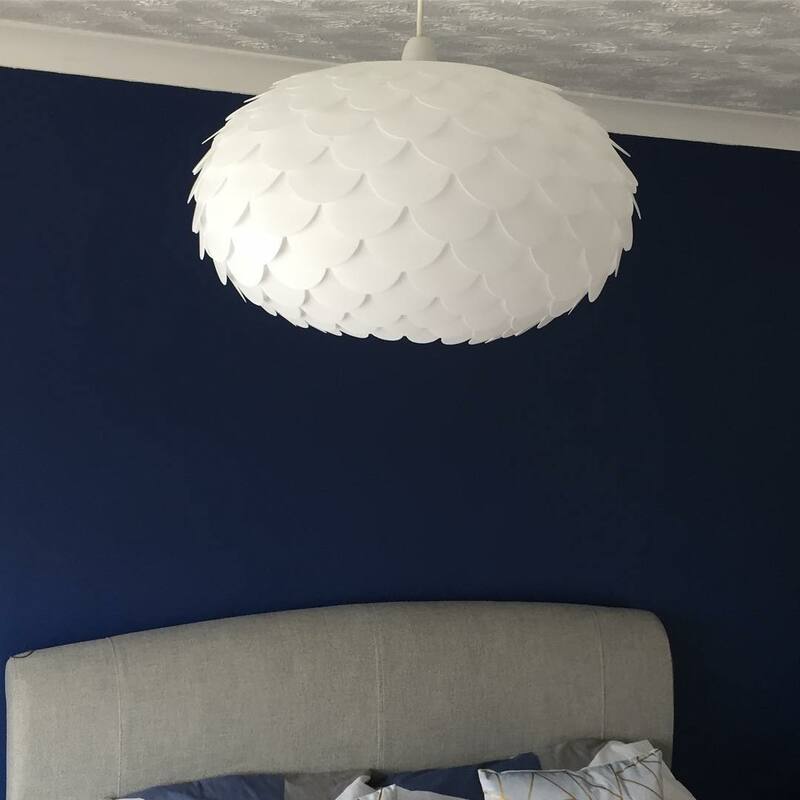 I wanted a navy feature wall and Dulux's Sapphire Salute had been recommended. 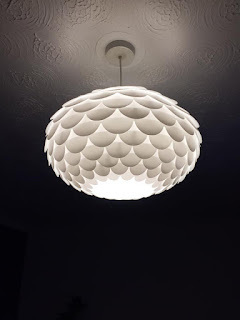 We managed to pick it up whilst on offer in our local Wickes at buy one get one free for a 2.5 litre tin. We decided on white paint for the other three walls and I put the OH to work with a paint brush or two! Next on my list was the sleigh bed. This had been on my 'want' list for a very long time. 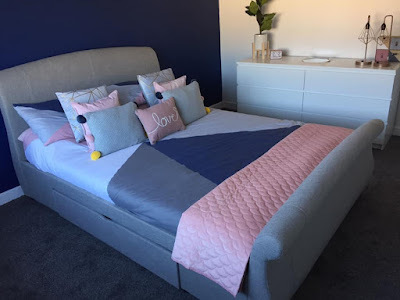 We had a divan base bed which we had for many years and so I shopped around for a style that we liked. We settled on the Bel Étage Winchester upholstered sleigh bed frame from Wayfair. It still had two very spacious drawers underneath too which was great. I had also bought a home magazine recently which had a voucher in for 10% off your first order so that came in handy when ordering too. All of the cushions, bedding and throw are from Asda. I love all of the cushions but the knitted pom pom cushion is my favourite. We had decided to get rid of the wardrobe and tall boy that we had in a very dark wood which had also seen us through a fair few years of storage duties and we went for white furniture. 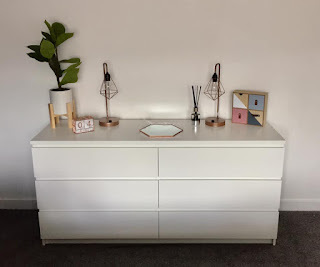 The hanging items from the wardrobe where rehomed in a built in cupboard space in another room and we bought the Ikea Malm double drawer unit for our room. Between the Malm drawer unit and the spacious under bed drawers there is plenty of space for all of clothing. Bedding, cushions and accessories all needed to co-ordinate. Or at least in my 'throw it all together and hope it looks good' eyes it needed to match as much as possible. 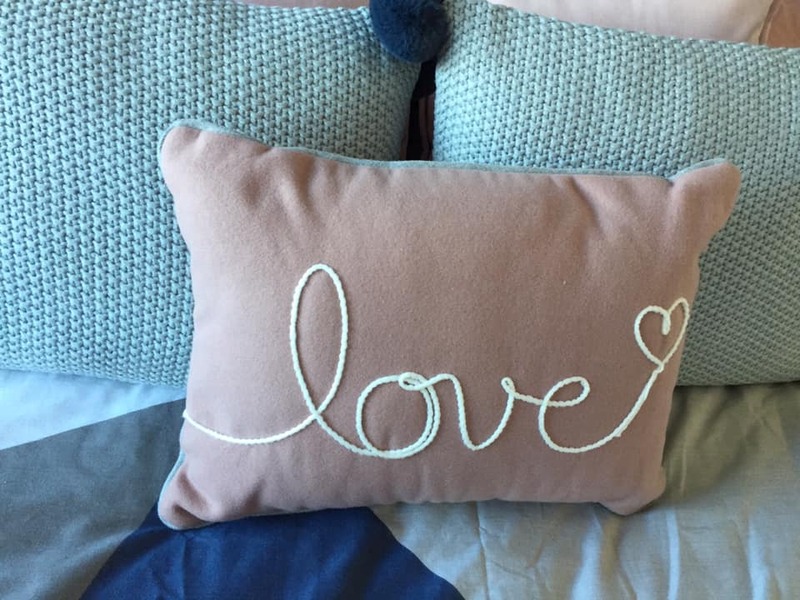 Asda Home have loads of fab products at the moment and all of our bedding, cushions, and accessories on the Malm unit are all from there. 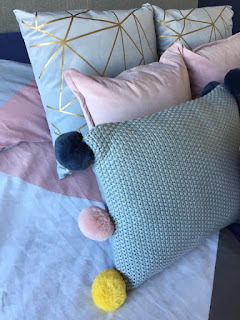 I love the grey knitted pom pom cushions and the pink quilted throw on the end of the bed. The geometric bronze lamps will be put on bedside tables once I've decided on some. 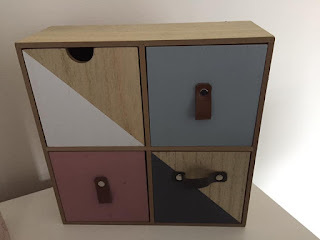 Ikea Malm drawers with all of our accessories. 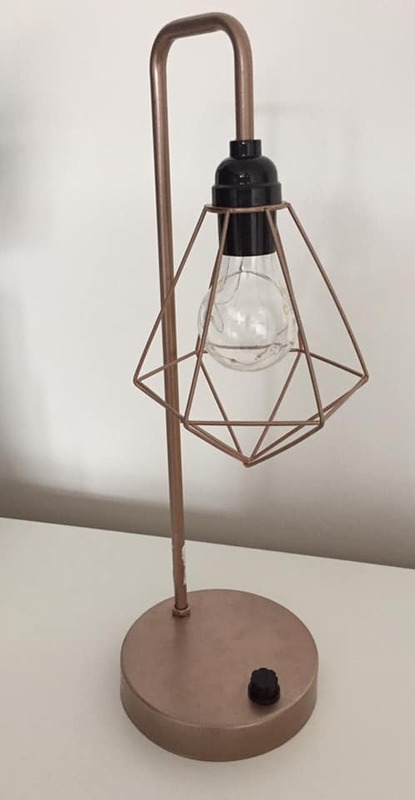 The geometric lamps are for bedside tables which we are yet to purchase. Malm drawers, £80, Ikea. All of our accessories are from Asda. They have a great range of products to choose from at the moment. 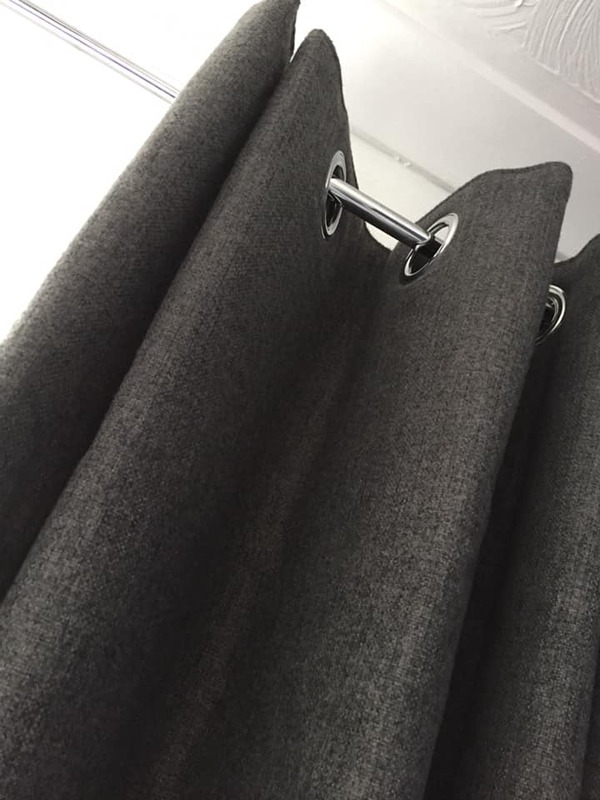 The curtains, curtain pole and lampshade came from Dunelm. We are very lucky to have a store in our town so myself and a friend met there for coffee and spent a good couple of hours browsing through the whole store. I settled on the Harris charcoal thermal eyelet curtains, extendable trumpet end curtain pole and the Priya white easy fit pendant lampshade. 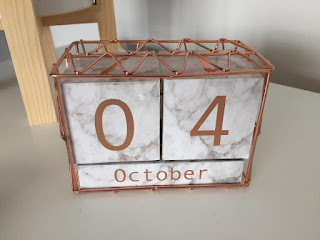 The same home magazine that gave me discount for Wayfair also had a 15% discount code for Dunelm on purchases over £50 so again we saved money on purchases for our room makeover. The gorgeous Dunelm Priya lampshade, Harris thermal curtains in charcoal and trumpet curtain pole. The faux plant in the planter was a huge bargain from Sainsbury's. I spotted it in there a few weeks ago but at £24 I was hesitant to buy then when I popped in a few days later it had been reduced to just £7.20. 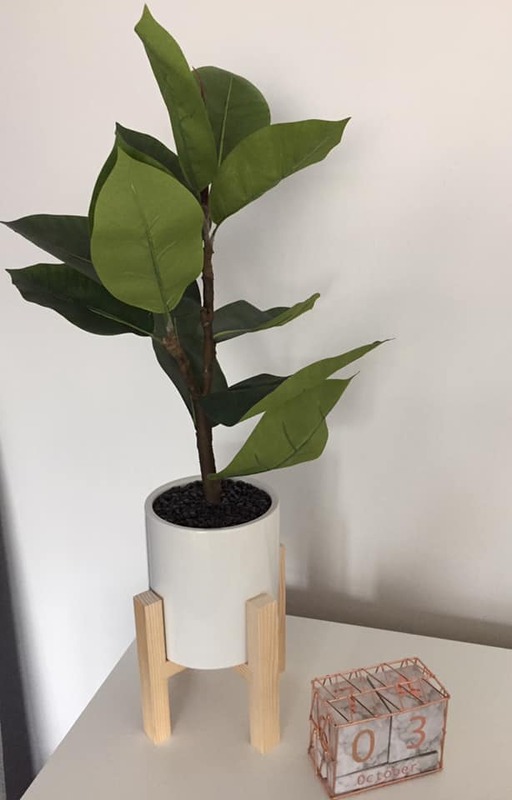 Faux plants are my best friend, I cannot look after real plants! Sainsburys faux plant and footed planter. Bargain at £7.20. There is a still few more things I would like to add. Maybe a chair in the corner like the Dunelm Isla chair which looks gorgeous and comes in grey, pink and midnight so either colour would fit perfectly with our colour scheme and some prints on the walls but for now I am loving the end result. However it now puts the rest of the house to shame! Pass me a paint brush, I'm on a roll. *Bel Étage Winchester upholstered sleigh bed, £449.99 in king size, Wayfair. Pink quilted pinsonic throw, £15, George Home at Asda.